Daily Mail reports the end of the world is not nigh. Life will thrive on Earth for at least another 1.75billion years and perhaps as many as 3.5billion. Beyond then, the Sun will have become so hot that nothing will be able to survive, scientists believe. Ever since it was formed our planet has been at just the right distance from the Sun to make it habitable. Being in this ‘Goldilocks’ zone has allowed oceans to develop in temperatures neither too hot to boil the water away, or too cold to freeze it into permanent ice. The problem is, however, that stars become hotter over time, ensuring that the habitable period cannot last. As the stars emit more heat, any surface water on nearby planets dries up and without water nothing can survive. At this point, the Earth will have ‘moved’ out of the habitable zone even though its position will be exactly the same. The prediction comes from experts at the University of East Anglia, who believe the world can expect between 6.3billion and 7.8billion years of ‘Goldilocks’ conditions from its birth around 4.55billion years ago. That means there can only be 1.75billion to 3.5billion years of life left. 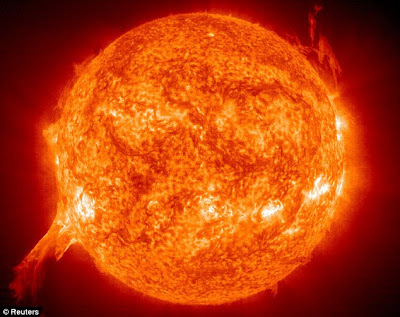 Andrew Rushby, a researcher at the university, said: ‘After this point, the Earth would be in the hot zone of the Sun, with temperatures so high that the seas would evaporate.